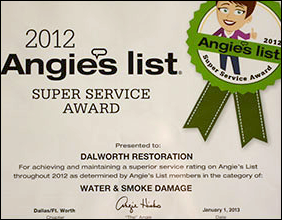 Dalworth Restoration offers water damage restoration, fire damage restoration, mold remediation, contents cleaning and other related services in Dallas, TX. We are a full service restoration and construction company licensed to work in Dallas and surrounding areas. 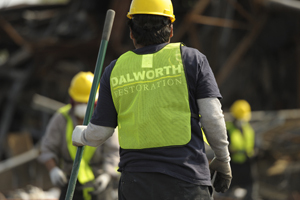 Dalworth Restoration is a family owned and operated restoration company servicing the greater Dallas-Fort Worth area since 1976. We offer inspection and estimate in Dallas, so, if you have a disaster in your home or business, call us at 817-203-2944 NOW!!! We are on standby 24/7 to handle any restoration emergency that you may have. Our certified and experienced professionals understand that the last thing you need when your house floods and causes water damage, the last thing you need is more stress. We will handle your emergency water damage clean up and repairs promptly and professionally to your satisfaction and peace of mind. We will estimate the extent of your flood and water damage, bill your insurance, perform water extraction and water removal, take care of content restoration and storage as well as complete all necessary water damage restoration of your home or business in Dallas. 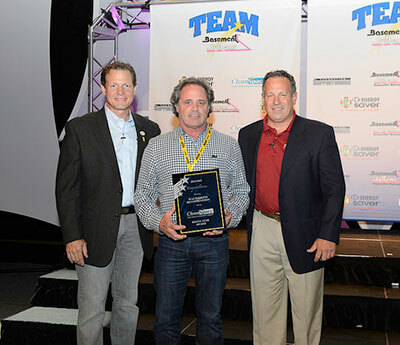 Water damage is always a crisis in the home but Cameron was an excellent service tech. He met with us immediately, walked us through the process, called us daily to make sure any concerns were addressed and supervised removal of all furniture so water could then be completeyand professionalremoved and finally,all furniture was moved back exactly the way it was. I have given his name and Dalworth to all my family and friends in case the worst happens. Thank you Dalworth! It’s always like having friends come to visit when the technicians arrive! I can’t imagine why anyone would ever use another company to clean rugs! Excellent service and professional people. Response was quick. Techs were knowledgeable, polite, and respectful of my property. 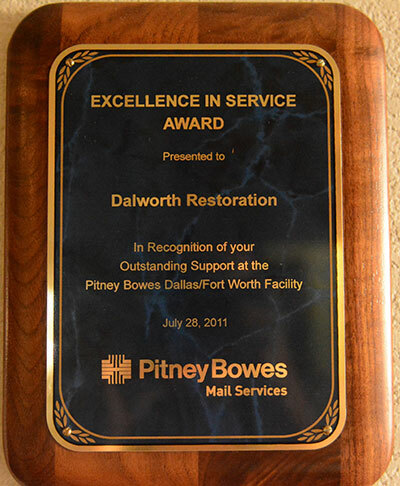 A water damage restoration project was successfully completed in Dallas, TX this week by Dalworth Restoration. Through an internet inquiry, Dalworth Restoration was contacted to remedy a situation in which a family’s home was affected by previous water damage to the extent that there was mold growth on walls from flooding that occurred in the basement. I would recommend your company to anyone in this situation in the future. 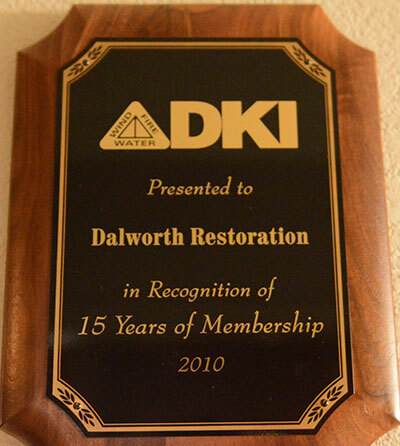 Marie K. in Dallas, TX Writes, It would be my pleasure to recommend Dalworth Restoration to any of my friends and acquaintances.. Very pleased with all the work from Brian Cane and Nick Hobbs. Kimberly S. in Dallas, TX Writes, What a great guy. Bert M. was our technician. I was very pleased by the prompt response from Dalworth and very impressed with the intelligent explanation of what needed to be done. The daily follow up for 3 days that the situation required was performed as promised. Very impressed with the timely service, as you all contacted me within the hour of when you were contacted by Chubb. Within another hour, Justin was at my door to start the process. Persistent water leakage can often lead to severe and harmful mold damage. the worst flood in Dallas history was in May of 1908, when the Trinity rose to 52.6 feet. Hi. We've had water running from our second floor to the garage for about a month. Our building is refusing to fix any of the damage since he says everything is ok. Could you come do an estimate for us? How much would that cost? Townhome has large flat deck on top of master bedroom on third level. Water leaks from corner and under access French Doors; and/or from wall sliding as well. Three areas inside home have ceiling damage. Drainage problems on deck and there's also attic wood rot from undetected leaks from the past. Need evaluation on how to repair/restore deck and related problems. I need to talk to someone who can help me with a bid on installing a "mechanically induced ventilation system under my residence." Hoping for a quote regarding a pigeon infestation in a historic building in Oak Cliff Texas. Pigeon's are now removed, but lots of waste / feathers remain. Thank you. There is a terrible smell coming from the return grilles in the walls from the crawl space. It smells like wet old dirt and we need to get this inspected and removed as soon as possible. Please contact me via email to setup a time to visit about residential mold cleaning and crawl space moisture management. Not an emergency. Please do not call tonight. This is not an emergency. Just want to speak to someone first and maybe schedule an appointment to evaluate the situation.